Sales on Anna Maria Island one months into the third quarter of 2018 show Y-T-D sales again up 5% at 277 (SF-164, Con-90, Dup-14 & Lot-9) compared to the same point in 2017 with Y-T-D sales of 263 (SF-152, Con-82, Dup-15 & Lot-14). 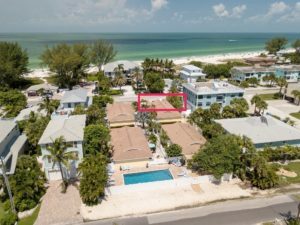 Sales on Anna Maria Island for July 2018 were up 8% over 2017. For July 2018 AMI sales were 43 (SF-27, Con-13, Dup-2, & Lot-1) compared to July 2017 at 40 (SF-24, Con-12, Dup-2 & Lot-2). Sales for the last 12 months (August 1, 2017 to July 31, 2018) for Anna Maria City, Holmes Beach and Bradenton Beach were 417 (SF-237, Con-143, Dup-24 & Lot-13) up 5% over the previous 12 months (August 1, 2016 to July 31, 2017 at 398 (SF-223, Con-132, Dup-25 & Lot-18). Of the last 12 months sales (August 1, 2017 to July 31, 2018) only .7% or 3 (SF-1, Con-1, Dup-1 & Lot-0) were distressed properties (bank owned or short sales) compared to 2% or 7 (SF-3, Con-2, Dup-2 & Lot-0) for the previous 12 months (August 1, 2016 to July 31, 2017). Inventory has dropped down below 300 this month again for the third month in a row after popping up just over 300 the previous three months. Inventory is currently at 266 (SF-161, Con-76, Dup-16 & Lot-13). Inventory for the previous fifteen months was at 289, 295, 308, 313, 308, 297, 254, 249, 231, 214, 223, 240, 254, 267, & 297. To summarize the Anna Maria Island market for the first seven months of 2018 it’s continuing with very strong sales Y-T-D continuing up 5% over 2017 which as I mentioned in last month’s newsletter, was an exceptionally strong sales year at 401 properties sold and historically low inventory which we have experienced since 2010. Attesting to the strong market on AMI, I have again left the article that I put in May’s newsletter from a personal finance site (GOBANKINGRATES- see attached article) that used data from Zillow comparing median home prices from January 1998 and January 2018 in 25 cities around the country to identify those where prices had gone up the most. Of the top 10 cities it’s not surprising that 8 were in California, 1 was in Hawaii and the #5 city was Anna Maria. Holmes Beach was in the top 25 at #23…. Which supports the great long term value in property on the island. The properties on this month’s Frank, Scott & Al’s Great Buy’s list have some changes from last month. If you’re looking for a great location in Holmes Beach with 180-degree views of the Gulf, then you must look at this one of a kind condo 5622 Gulf Drive Vista # 4 listed at $2,600,000 arguably the best built complex on the island with only 4 units in the complex. At the other end of the spectrum is 3303 Gulf Dr. Pirates Cove #1 totally remodeled condo listed at $429,000. Call me for more information on these or other real estate opportunities. If you look at the average and median sales prices for single family homes and condos over the last 12 months versus the previous 12 months you can see that single family homes are up 6% & 8% respectively and condos are up 13% & 16% respectively year to year. Pended properties (properties under contract) have dipped down this month at 28 (SF-12, Con-13, Dup-3 & Lot-0) which is quite a dip from the last several months. Distressed properties continue to be non-existent again with none in the current inventory. Of the current AMI inventory of 161 single family homes the average sale price is $1,543,007 and the median sale price is $1,295,000. The lowest priced single-family home on the island is currently $475,000 and the highest priced is $6,495,000. For the 76 condos currently for sale on AMI the average and median sale prices are $624,246 & $505,750 respectively with the lowest $198,900 and the highest $2,600,000. The Longboat Key current inventory is 277 (SF-86, Con-165, Dup-1 & Lot-25) down from the last four months at 307, 320, 377 & 403 and well below the low of the previous five months at 304,314,336,345 and 374. Of the current inventory of 86 single family homes the average price is $2,130,724 and the median price is $1,192,000. For the 165 condos currently for sale the average sale price is $811,107 and the median sale price $565,000 with the lowest price at $169,900 and the highest price at $6,100,000. Pended properties on Longboat Key are 51 (SF-13, Con-35, Dup-0 & Lot-3) significantly down from last month at 80 and near the low’s for the previous nine months at 63, 95, 113, 86, 45, 54 ,49, 62 & 86. There is only one distressed property on Longboat Key. See https://www.AnnaMariaLuxuryRealEstate.com NEWSLETTER for detailed charts and facts for Anna Maria Island Real Estate for sale.